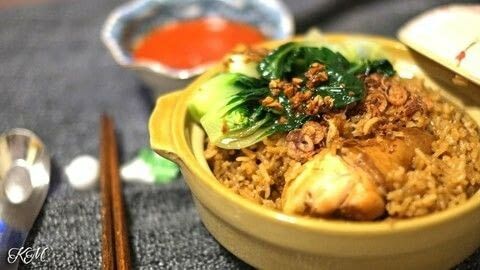 This recipe for the classic Claypot Chicken Rice is as simple as it is tasty and fragrant, and I guarantee you will cook this whenever you can! Start by marinating the chicken pieces in the sauces stated for the marinade. Allow to rest in the refrigerator for at least an hour before cooking. When you are ready to cook, prepare the garlic cloves by removing the skin, then scrape off the skin of and slice up a piece of ginger. If your chinese sausage has a casing, remove it first before slicing it as thinly as possible. In a wok, heat up the 3 tablespoons of any kind of vegetable oil. When the wok is hot enough, throw in the garlic cloves and ginger, and use your spatula to stir them around for about 30 seconds. Next let's introduce the Chinese sausage into the party (and the mushrooms if you have chosen to add them), stir that around too with the garlic and ginger for another 30 seconds. At this time, take the marinated chicken pieces out from the fridge and gently place the pieces into the wok and sear and brown every piece in the hot oil with the garlic, ginger and Chinese sausage slices. **Take note to save the container that your chicken was marinating in, we will need that later, just set it aside for now. Turn the fire down. After about 3 minutes from the time you added the chicken, add the rice in with the chicken and mix everything up to combine evenly. 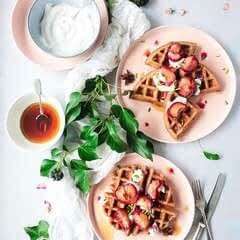 Throw in the additional tablespoon of soy sauce (for added taste), 2 teaspoons of dark soy sauce (to add colour to the rice), 2 teaspoons of sesame oil and 1 tablespoon cooking wine (both for fragrance), and use your spatula to combine. Transfer the contents of your wok into the nonstick metal bowl of your rice cooker. In the container that used to house your marinating chicken pieces, measure out 4 cups of water which should be incorporated into any marinating sauce that is left on the container, and pour it into the metal bowl of the rice cooker. Switch the rice cooker on to cook your rice, and in 20 minutes or so you will have an absolutely heavenly tasting dish!